故看來還是問題重重, 日後這些產品進來後我建議是優先供應總統府與五院人員以及中央政府各機關食用, 以及全省各縣市民進黨執政的公務人員餐廳與銷售中心, 讓官員有優先使用的權利, 外賓來, 尤其是日本來賓, 更要指定用核災縣市出產的食物招待, 才能表達台灣人飢己飢, 人溺己溺的民胞物與精神. On March 21, 2011, the Japanese Prime Minister ordered the Governors of the affected prefectures of Fukushima, Gunma, Ibaraki, and Tochigi to stop the distribution of spinach and kakina (a local Japanese vegetable) into the market, and ordered the Governor of Fukushima prefecture to stop the distribution of raw milk. 日本首相在 03/21/2011 命令 受影響縣份的政府 福島,群馬 茨城 櫪木 停止經銷 菠菜 カキナ一種日本地區性的蔬菜 進入市埸, 並命令福島縣政府停止經銷生乳. 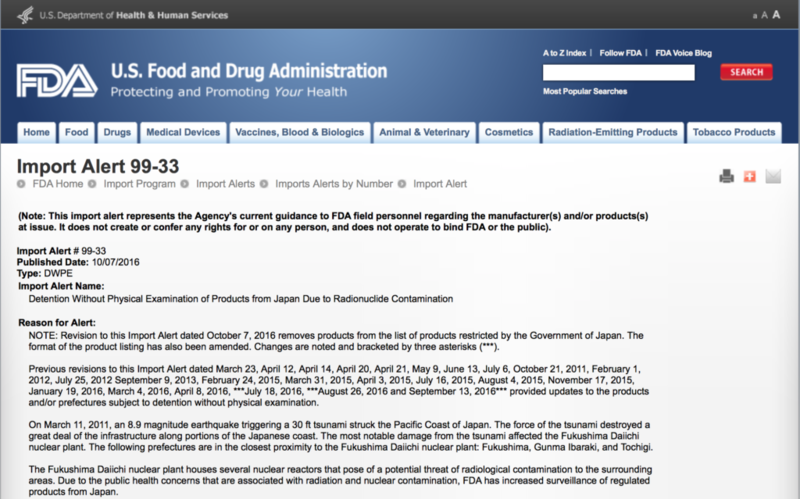 On March 23, 2011, the Japanese Prime Minister ordered the addition of flowerhead brassicas, head leafy vegetables, and non-head leafy vegetables to the group of products previously restricted from distribution into the market on March 21, 2011. The Governor of the Ibaraki prefecture was also ordered to stop the distribution of raw milk and fresh parsley. This means no such products may lawfully be placed in the domestic or export markets. From June 1, 2012 to July 10, 2013, the Japanese Prime Minister also ordered the removal of the following products from the group of products restricted from distribution into the market tea leaves from the Chiba, Gumna, Kangawa, and Tochigi prefectures; and Pacific cod from the Iwate and Miyagi prefectures. 注意囉 ! 從2012年 6月1日 – 2013年 7月 1日 , 千葉,群馬,神奈川, 櫪木 的茶葉, 和 岩手,宫崎 的太平洋鱈魚從禁銷中解禁了. February 2015, the Government of Japan ordered the addition of the Iwate, Miyagi and Gunma Prefectures and the removal of the Ibaraki prefecture for milk, filled milk, and milk-based infant formula. Also the addition of eel from the Chiba prefecture; the correction of milk to raw milk, Braddblotched rockfish to Brass Blotched Rockfish, the removal of Cultivated wasabi, starspotted smooth-hound, Flathead Flounder, Gurnard, Halfbeak, Littlemounth Flounder, and Northern Sea Urchin, and the addition of Turnips and Scorpion Fish from the Fukushima prefecture; the removal of Tea leaves, Nibe Croaker, Olive Flounder and Pacific Cod from the Ibaraki prefecture; the removal of buckwheat from the Iwate Prefecture; the removal of buckwheat, Olive Flounder, and Panther Puff and the addition of Wild Araila Sprouts from the Miyagi Prefecture; and the addition of Koshiabura from the Nagano prefecture. 處理方式是Districts may detain, without physical examination . 本人出口醫材至美國10幾年, 出口醫材要通过biocompatible 檢驗 再申請FDA510K .拿到FDA510K 才能出口到美國.